Derjaguin–Landau–Verwey–Overbeek (DLVO) theory is used to classically model the interaction energy between two colloidal particles in a dilute aqueous electrolyte solution. In its simplest form, DLVO theory defines the total interaction potential energy as the sum of the van der Waals attractive energy and the electrostatic double-layer repulsive energy . 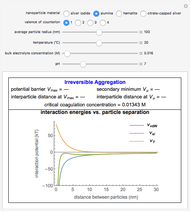 When the potential barrier , the maximum value of , is near or below 0, particle aggregation is inevitable and for all practical purposes irreversible as evidenced by the deep potential well (primary minimum) to the left of the barrier. However, when is high, the colloidal suspension will be energetically stable. Under certain conditions, a "dip" (secondary minimum ) will occur in the energy curve to the right of the energy barrier that is deeper than the thermal energy of the system. This dip is a potential well where flocculation occurs. 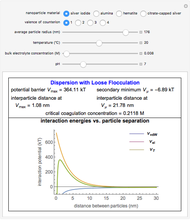 Flocculation is an aggregation of particles that can easily be redispersed by mixing or shaking the solution. This model assumes a dilute : aqueous electrolyte solution of homogeneous spherical nanoparticles. Alumina and hematite are oxide minerals; therefore, the charge-determining ion for these materials is the proton and the colloidal behavior is directly related to the pH of the solution. The charge-determining ion for silver iodide is , which requires the use of the van't Hoff equation to determine the amount of present in the solution at a given temperature. Thumbnail: Citrate-capped silver nanoparticles remain dispersed in a dilute solution containing a 2:2 electrolyte. There is a very shallow secondary minimum when two particles are about 29 nm apart. This potential well has a depth of about 2 kT, which particles can easily overcome by the thermal energy of the system. 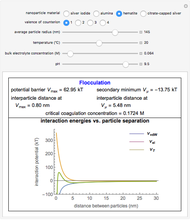 Snapshot 1: In a solution with pH greater than 9, hematite particles with an average diameter of 145 nm can form flocs where the average distance between two particles is about 5.5 nm. 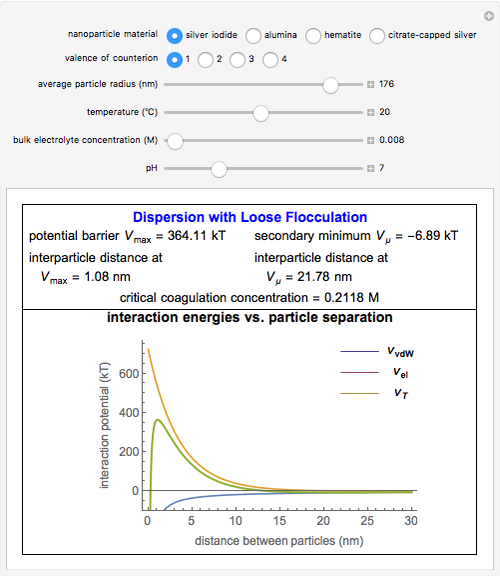 Flocculation can occur when the secondary minimum has a depth of over 5 kT. 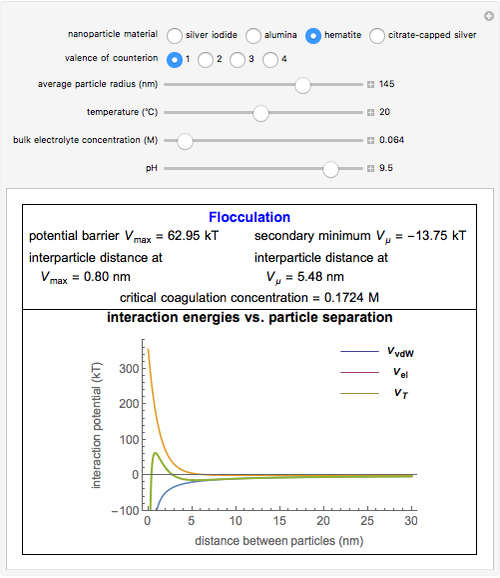 Flocculation does not lead to aggregation as long as the difference between the potential barrier and the secondary minimum is over 10 kT. Snapshot 2: Here, silver iodide particles are considered loosely flocculated with the well depth of the secondary minimum between 5 and 10 kT. Snapshot 3: Alumina has a point of zero charge (PZC) around pH equal to 8, which means that at a pH of 7, the surface charge of alumina is very small in magnitude and can easily be screened by a very dilute electrolyte concentration. 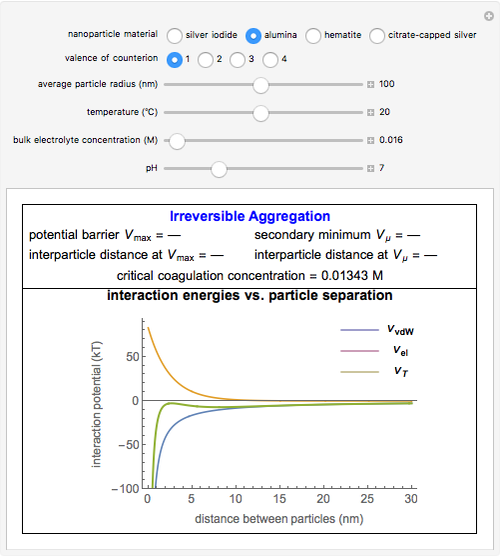 Consequently, two alumina particles will not experience the repulsive effects of their similar surface charge at an adequate distance to avoid irreversible aggregation. The use of trade, product, or firm names in this report is for descriptive purposes only and does not imply endorsement by the U.S. Government. The tests described and the resulting data presented herein, unless otherwise noted, were obtained from research conducted under the Environmental Quality Technology Program of the United States Army Corps of Engineers by the USAERDC. Permission was granted by the Chief of Engineers to publish this information. The findings of this report are not to be construed as an official Department of the Army position unless so designated by other authorized documents. Gail Blaustein and Mark Chappell "Interaction Energies between Spherical Colloidal Particles in a Symmetric Electrolyte Solution"